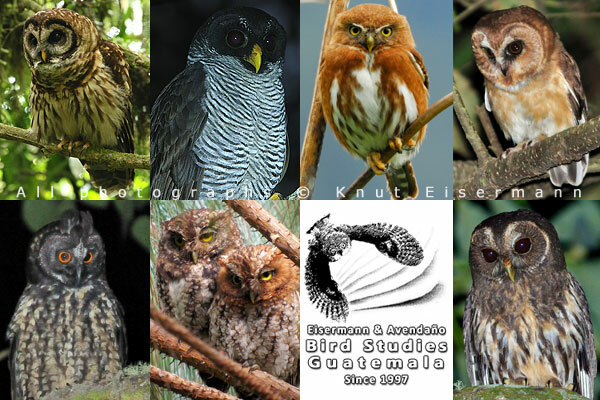 Some owls of Guatemala: Fulvous Owl, Black-and-white Owl, Guatemalan Pygmy-Owl, Unspotted Saw-whet Owl, Stygian Owl, Bearded Screech-Owl, and Mexican Wood Owl. Abstract.—This compilation of recent data on the distribution, ecology, and conservation status of owls (Strigiformes) in Guatemala is based on an extensive literature review and numerous unpublished observations. Twenty species of owls have been recorded in Guatemala, of which 18 are resident. Breeding has been reported for 17 species, and it is assumed for one species. Two species are considered rare or accidental nonbreeding visitors to Guatemala during the northern winter. Guatemala's region with the highest species richness in owls is the highlands, where 17 species have been recorded. Twelve species have been recorded in the Pacific slope lowlands and 13 species in the Atlantic slope lowlands. We analyzed the data in the presence and relative abundance of owls from 105 sites from 1989 to 2016. According to the weighted mean value of the relative abundance index across three ornithogeographic regions, the most common owls in the country are (abundance ranking in descending order): Mexican Wood Owl (Strix squamulata), Ridgway's Pygmy Owl (Glaucidium ridgwayi), Guatemalan Screech Owl (Megascops guatemalae), Black-and-white Owl (Strix nigrolineata), American Barn Owl (Tyto furcata), Central American Pygmy Owl (Glaucidium griseiceps), Guatemalan Pygmy Owl (Glaucidium cobanense), Great Horned Owl (Bubo virginianus), Fulvous Owl (Strix fulvescens), Unspotted Saw-whet Owl (Aegolius ridgwayi), Whiskered Screech Owl (Megascops trichopsis), Crested Owl (Lophostrix cristata), and Pacific Screech Owl (Megascops cooperi). Guatemala has an adequate legal framework to protect owl species (32% of the country is legally protected), but the conservation is not efficient, causing threats to owl populations. Of 18 resident owl species, 12 are forest specialists. In a vulnerability assessment applying IUCN Red List criteria on a national level, one species has been evaluated as Critically Endangered (CR), one as Endangered (EN), nine as Vulnerable (VU), five as Near Threatened (NT), two as Least Concern (LC), and two as not applicable. Habitat alterations through agriculture, mining, and oil drilling are the main threats. Of the remaining forests, 14% (5500 km2) were lost from 2000 to 2010, and the pressure on natural habitat will further increase. In addition, owls in Guatemala are threatened by direct persecution because of popular superstitions. The network of 21 Important Bird Areas (IBA) in Guatemala includes populations of all owl species. Three species have been recorded in at least 10 IBAs, 12 species in 5-9 IBAs, 4 in 2-4 IBAs, and 1 species in only one IBA. We consider the increase of the education level among the Guatemalan society the main key to protect habitats within the IBAs. A higher level of education would help to slow down population growth, increase environmental awareness, and consequently diminish pressure on natural areas.